I'm not advocating drinking in the mornings, but there are certain times that simply necessitate it. Birthdays, crippling hangovers that morning TV and a cup of tea don't cure and an early lunch with the in-laws are all acceptable reasons for morning lubrication. That said, even I know drinking pre-noon on an empty stomach is a bit of a reckless move and one must tread carefully. This cocktail is the perfect solution, a Breakfast Martini… a delicious citrus sharpener with a side of well done toast. 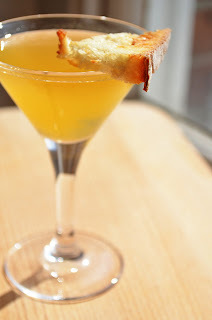 A little like a 1920s Marmalade Cocktail, I 'borrowed' the garnish idea from when I had it at London's Paramount Bar. Between the smell of the toast, and the punch of the marmalade flavour it's a totally respectable replacement for your usual bowl of cornflakes, and I'm sure it could even count as one of your five-a-day. Woah. You're such an enabler, Nick. You mean there are people that turn up to morning family-engagements sober?